Just when you thought it was safe to move on from Hurricane Osteen, the Gospel Coalition felt the need to add one more voice to the cacophony of shrill defenders of the absolutely indefensible. Seriously? The Gospel Coalition? The organization that totes such reformed heavyweights as John Piper and Tim Keller? What in the world is going on in the church today? Joel Osteen does not serve the body of Christ beloved. He is leading countless numbers of people away from Jesus Christ by preaching an incomplete and false Gospel. This is not something that has to be ferreted out. Osteen admits it! Just last year he stated that he does not feel he is cheating people by neglecting to preach about hell or repentance! Are we serious? When Paul leaves the Ephesian elders he states that he is innocent of their blood because he did not hesitate to preach the entire counsel of God. 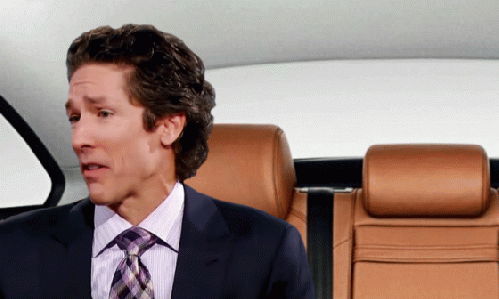 Does anyone seriously think Joel Osteen is innocent of the blood he will answer for? Let us reason together one more time beloved in response to the above linked article entitled, "Does Your Social Media Outrage Bear False Witness?" This is the primary false talking point employed by Osteen defenders regarding the recent hurricane that devastated Houston. A handful of people using social media claimed people were "turned away." This of course was not the actual problem with how Osteen handled the hurricane. The problem was he essentially turned everyone away by posting on his Facebook page that the church was inaccessible due to flood waters, which was not true, and then providing a list of other places they could find shelter. Perhaps to the Gospel Coalition this is acceptable but to those who understand hypocrisy it is not. So did Osteen turn people away? Absolutely. How effective was this turning away via Facebook? Osteen flacks admit that only three people showed up at Lakewood for help. Three people beloved. To a facility that holds 20,000 people and sees traffic exceeding 50,000 every weekend. Three people. To a church that rakes in over $600,000 in tithes and offering every weekend. The worst part is that because the church helped these three people the Osteenites use this as proof that they did not turn anyone away. How sickening. Did it honor the Lord? Yes the truth is always honoring of the Lord who hates deception. For instance, it is deceptive to use the three people, which proves he turned people away, to claim the opposite. It should be embarrassing to the largest church in the country to claim victory because they helped three people. As for the claim of flooding this has been debunked by Osteen himself. He admitted that Lakewood was not flooded. The floodwaters had risen to within ten feet of the flood gate and they were concerned about it but it did not flood. Even if it had? Does that mean Lakewood is unusable as a shelter? How many floors and levels exist in the former home to the Houston Rockets? Does anyone seriously think that the other places that served voluntarily as shelters did not experience flooding? Even the huge facility down the road from Lakewood had their entire first floor flood on Tuesday. Yet they still took in ten thousand people. Do you know how many their capacity was for? Five thousand but when you care about helping people, you help them. By the way, the official reason given by Osteen for not opening Lakewood was not flooding but because the city had "not asked him." This is all public record.